Even at its $106,600 starting price, this is one costly cat. 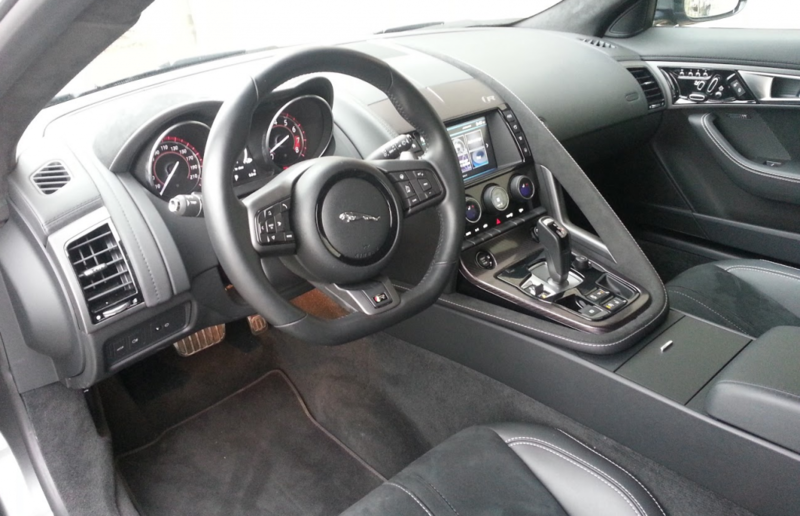 Yet our test car added some options that brought this ferocious all-wheel-drive feline to a bottom line of $123,745. There is, Jaguar clearly believes, more than one way to skin a cat. Having introduced the 2-seat F-TYPE for model-year 2014, it continues to tinker with the basic package in search of the right blend of features and performance for the not inconsiderable money. The 2015 model year saw the addition of a coupe to go with the debut convertible. Now, 2016 welcomes a shakeup in the model offerings, the addition of all-wheel-drive variants, availability of a 6-speed manual transmission, electric power steering, a new Jaguar InControl connectivity suite for the infotainment system, and more standard equipment. The sloping rear roofline doesn’t do much for visibility or cargo space, but it sure does look sharp. At the top of the lineup sit the F-TYPE R duo, the carryover coupe and a new convertible, which essentially replaces the 2014-15 S V8 convertible. Both R models boast a 550-horsepower supercharged V8 and an AWD drivetrain. 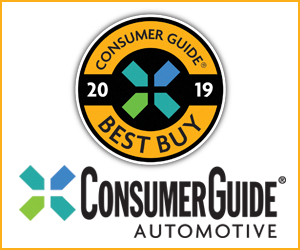 Consumer Guide® editors sampled the R coupe, which has a base price of $106,600. Picking up where the F-TYPE S AWD coupe leaves off, the R adds the aforementioned blown V8, 20-inch alloy wheels, driver-selectable “Active Sport Exhaust” with quad exhaust pipes, beefier “Super Performance” brakes, “Electronic Active Differential,” dual-zone climate control, “R”-embossed performance seats, leather-wrapped flat-bottomed steering wheel with silver gear shift paddles, heated seats and steering wheel, power hatch lid, rear parking sensors, and a remote garage-door opener. The R powerplant is wonderfully chesty, with “all-there” throttle response that’s almost as immediate as an electric. 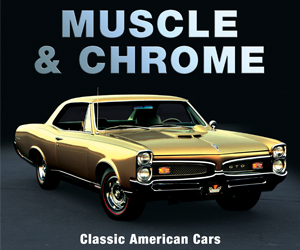 Chalk that up to a healthy 502 lb-ft of torque that peaks in the 2500-5000-rpm range. That power winds out evenly with the help of the smooth 8-speed “QuickShift” automatic transmission. Jaguar claims the R will go from rest to 60 mph in 3.9 seconds and top out at 186 mph. The exhaust system, which uses active bypass valves to change the flow of exhaust gasses, gives the R an undeniably muscular note, particularly at start-up, but doesn’t disturb the peace too much at cruising speed. Indeed, it struck this tester as a little more appropriately refined than the racket raised by the S V8 with this exhaust that CGers drove in 2014. Our test car’s rich but subdued interior materials were augmented with optional suede coverings on the seats and door panels. The all-wheel drive directs all of the engine’s torque to the rear wheels in normal driving conditions but can transfer up to 50 percent of the available torque to the front wheels if the system determines the rear wheels are at their limit of traction. Don’t expect that to turn this Jaguar into a snow leopard, however—not with “summer” rubber underfoot. Perhaps more helpful in that regard is a “snow/ice” setting for the transmission that alters power delivery. With remnants of a freakish pre-Thanksgiving storm still on the surface of his residential side street, this driver was able to get to better-tended main roads without a slip. As for the rest of the R’s onroad behavior, steering and braking are excellent, and ride is surprisingly good for this type of car—firm, but not jarring. The sport suspension features continuously variable damping and “predictive” shock-absorber adjustments to control motion in the aluminum body. The test car was equipped with extra-cost carbon-ceramic brake rotors that stopped it on a dime—lots of dimes, in fact. The option costs $12,000, and includes yellow brake calipers (in place of the standard red) and forged-alloy wheels. Though easier to use than those in many luxury cars, the audio controls still require some study, while the climate controls are simple and intuitive. Once passengers drop themselves into the grippy seats (side bolsters are adjustable), they’ll find themselves in a nicely done cabin where soft-touch materials cover almost all surfaces that occupants are likely to touch. In the test car, the seats had their leather center sections replaced by optional suede inserts (also found on the door centers) for better hold during brisk maneuvers. Working the fine 770-watt Meridian audio system is a little less complicated than in some rival luxury brands, but still requires a fair amount of attention to the screen—which it shares with the standard navigation system. The in-dash screen washes out in direct sunlight. 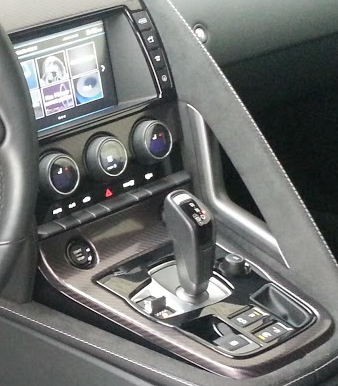 There is a nice view of the key driving gauges and the vehicle-information display that is between them. Climate controls use a combination of easy-to-use dials and toggle switches that are separate from the audio/navigation system, and don’t rely on the center screen. Footwell space is somewhat limited, but with adjustments to seat track and height and steering-wheel location even taller drivers can fit. Room for inanimate stuff is a less ample. There’s a smallish glove box, and even-smaller armrest console box, and a modest open bin in the divider between the seat backs. Two cup holders in the console hide under a cover when not in use. There’s a narrow pocket in each door. The sloping roof severely limits the shape of what can be carried in the trunk, but capacity is a pleasant surprise given the size and silhouette of the F-TYPE coupe. With low side windows, a sharply raked windshield, and sloping backlight, overall outward vision suffers somewhat. You’d think that for $106,000 you would get not only an extremely competent car but a very complete one, too. That’s mostly true. CG’s test car actually ran up to $123,745 delivered. Yes, it added the carbon-ceramic brakes but there were also some cosmetic bits—plus a “Vision Pack” with items that might come as a surprise being extras on a six-figures vehicle including adaptive headlights, a rearview camera, and a blind-spot monitor. Scheduling issues limited me to just one day/night of urban commuting in our Jaguar F-TYPE tester, which brings to mind that age-old question: Is a taste of honey worse than none at all? You’d need a racetrack to fully explore the incredible capabilities of the F-TYPE R Coupe, though it’s plenty invigorating in stoplight-to-stoplight street driving as well. It’s hard to think of a car that costs more than $120K as a bargain, but the F-TYPE R stacks up mighty well on paper next to competitors such as the Porsche 911 or Mercedes-Benz AMG GT. You’ll spend plenty more to get comparable horsepower levels if you shop the German competition. 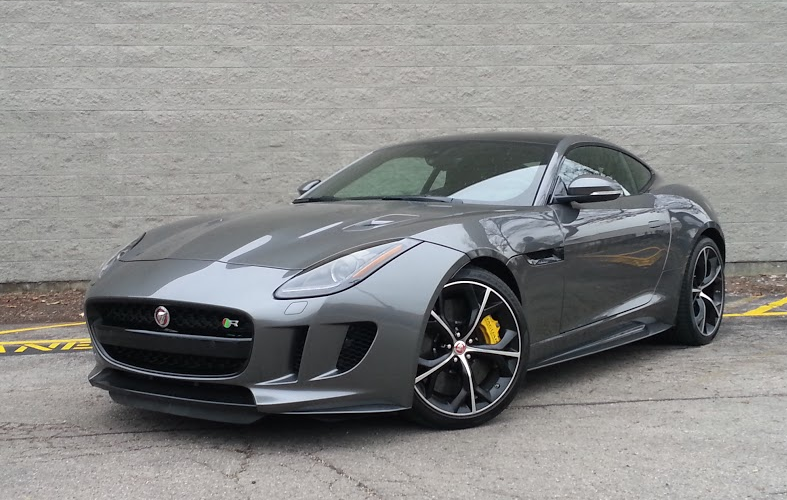 And even then, the F-TYPE R boasts a swagger all its own. Where the German supercars can seem almost antiseptic in their precision, a fully kitted-up F-TYPE has an almost sybaritic vibe, from its suede-lined cabin to its gratuitously ferocious (and utterly delightful) exhaust note. For Pete’s sake, it has a power rear hatch lid! Though it coddles with its host of swanky grand-touring car amenities, the F-TYPE R really delivers the goods performance-wise too. 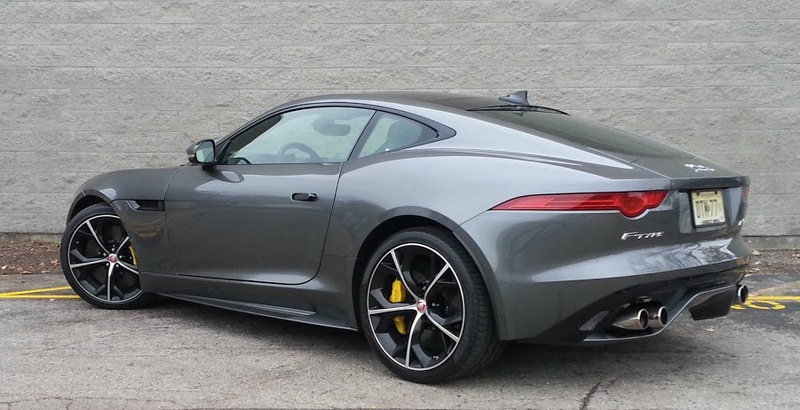 If you’re in the market for a supercar that’s ritzier than a Corvette Z06, more passionate than a Nissan GT-R, and more debauched than a 911, be sure to check out an F-TYPE R.
Written by: The Daily Drive staff on December 1, 2015.on April 26, 2018.